I must confess that I half agree with him. 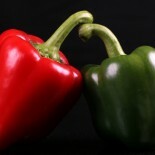 Those green leaves (and red ones), nutritious and healthful as they are, just don’t turn me on by themselves. But unlike Toby, I find I do enjoy salads very much – if I cover them with something. Because I am inherently lazy, I try to find premade salad dressings that contain a minimum of unpronounceables. But if I’m doing a big bowl of tossed salad and I want to do a home-made dressing while barely thinking about it, I use a method taught me by my good friend Alison Bidwell. Get your greens and put them in a bowl. Pour on some really good olive oil. Toss. Pour on some cider vinegar, or balsamic, or vinegar of your choice. Toss some more. Shake some dried herbs on top. Toss again. Garlic. Toss. Salt. Toss. Pepper. Toss. Build your salad dressing in layers, until the weeds – I mean, the greens – taste just the way you want them to. Then add nuts or other crunchies, serve, and chow down. Salad’s good for you… incredibly good for you. 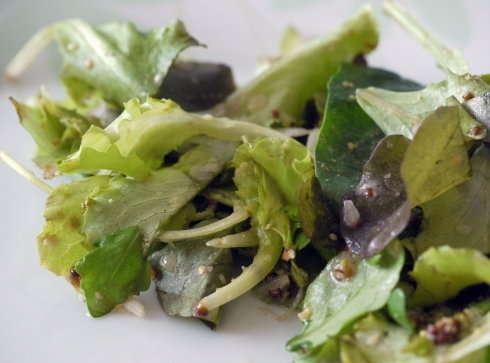 Whether you’re eating paleo or vegetarian or vegan or low-carb or low-fat or traditional-foods or raw-foods or heaven-knows-what, salad greens should always be on the menu. They’re an amazing source of natural nutrition and good health. But really, it’s all about the dressing. Love today’s blog, IT IS all about the dressing. This entry was posted on February 10, 2013 by thinkreadcook and tagged dressing, food, greens, leaves, nutrition, olive oil, paleo, raw, recipe, salad, vegan, vegetables, vegetarian.